Addiction is the most obvious and most commonly-cited side effect of drug use. But drugs can create a lot more problems than just dependency. And for a lot of drugs, it can take just one use to give you a negative side effect. Here are some of the side effects of some common drugs, both prescription and illegal. Abuse of depressants such as Xanax and Valium can have similar effects to those of alcohol abuse, causing hangovers. They can also cause nausea, seizures and comas. Abuse of such drugs has also been known to cause depression, hallucinations and suicidal thoughts. Mix them with alcohol and they can kill you. Stimulant abuse tends to create the opposite side effects to those of depressants. They can cause insomnia, increased heart rate and blood pressure, severe headaches, seizures, impotence and psychosis. Narcotics are so addictive that you are likely to experience physical and mental withdrawals. Such dependency increases the chances of overdose, which can be fatal. The extreme highs of amphetamines are usually quickly countered by extreme lows and depressive thoughts. Abuse of amphetamines can lead to increased blood pressure, hallucinations, convulsions, and ultimately death. Heroin is another drug that can give you respiratory problems, causing comas and even death. The drug also causes delirium and disorientation, as well as depression and confusion. Less serious side effects include nausea, constipation, and protracted vomiting. Cocaine can inspire a loss of appetite, an increased tendency to take risks, and increased aggression. It can also cause vomiting, restlessness, and insomnia. More serious side effects include rapid heart rate and increased blood pressure. As with the other drugs, cocaine use can ultimately lead to death. Smokers of marijuana can experience some of the same side effects as smokers of tobacco. In particular, lung damage can be severe. Smoking marijuana can severely impair your ability to concentrate, remember things, and increase anxiety, aggression, and agitation. The most common and dangerous effects of LSD come when you are on a trip, which can last up to 12 hours. Hallucinations and delusions can lead you to do dangerous and possibly self-harming things. Bad trips can stay with you, causing serious flashbacks and negative thoughts. Physical effects include dilated pupils, lowered body temperature, nausea, vomiting, rapid heart rate and convulsions. Steroid abuse has many physical and mental side effects, as it alters the hormones in your body. People can experience reversal of many of the effects of puberty, as well as increased aggression, heart disease, kidney disease, and liver disease. Ecstasy causes severe hallucinations and sometimes anxiety. It suppresses the need to drink or eat, and so can lead to dehydration and exhaustion. Physical side effects include, sweating, increased body temperature, muscle cramping, blurred vision, and long term brain damage. 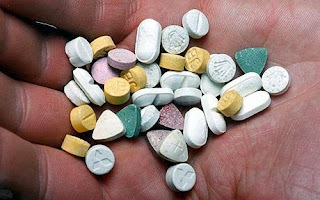 The real danger of ecstasy is that just one tablet can kill a person. There have been cases in recent years of people dying because of a bad reaction to a single ecstasy pill. As with all other illegal drugs, there is no way to monitor exactly what you are taking, so you may be taking a potentially fatal pill without even knowing.